Bu bölümde öğrenciler anlayamadıkları bölümleri daha iyi kavrayabilmek için kılavuz niteliğinde hazırlanmıştır. Konuyu daha iyi kavrayabilmek için buradan öğrendiklerinizle kendinizde çözmeye farklı örnekler yapmaya çalışınız. Öğrenci cevaplarını birebir kopyalamayınız. Buradaki 8. sınıf ingilizce the internet ders kitabı cevapları ve çözümleri sizin için derslerinize büyük katkı sağlayacak eksiklerinizi giderebileceksiniz. # 2. Use the computer words to complete the text. 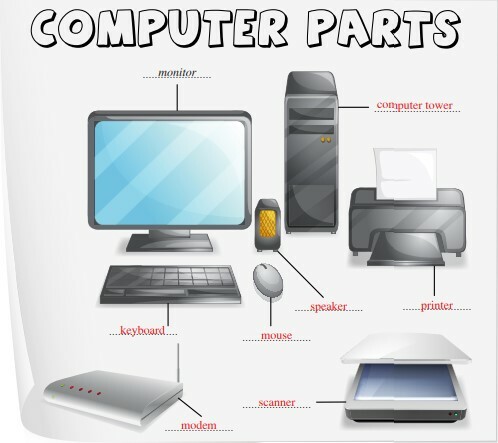 # The most important parts of a computer are the 1) computer tower (powers your computer), the 2 keyboard (you use it to type), and the 3) monitor (lets you see what you are doing). You will also need a 4) printer to print documents, a 5) mouse to click on icons and a 6) modem to connect to the Internet. If you want sound, you need to buy some 7) speakers, too. A 8) scanner can be useful to scan documents and photos into your computer. # 3. Complete the text with the correct forms of the verbs in the boxes. Then listen and check. # 4. Match the words (1-5) with the definitions (a-e). # 5. People have purposes for using the Internet. Why do you use the Internet? Tick (✓) the boxes. # 1. How often do you use a computer? What do you use it for? # 2. Listen and read the magazine article and find out which teenager thinks computers are: good fun, important for everything, not as good as books. # Jeremy thinks computers are not as good as books. Sibel thinks computers are important for everything. Adrian thinks computers are for fun. # 3. Read the article again. Then write T (for true) or F (for false). # 4. Discuss these questions in class: How many social networking sites can you name? What do people use them for? # Önerilen Cevap : Some social networking sites: Facebook, Twitter, Linkedin, About.me, Athlinks, Bebo, Buzznet, CafeMom, Flixster, Google+, Instagram, Kiwibox, Livemocha, Myspace, Netlog, Tumbir. People use them for sharing interests, activities, backgrounds or reallife connections. # 5. Read the text. Answer the questions. 1) He goes on it every day. 2) He chats to friends, uploads photos and updates his profiles. 3) He thought he had a problem. 4) They wanted to learn the reason why he left it. 5) He concentrated on his homework better and watched his TV programmes. He spoke to friends at school. # 1. Look at the photos. What do you think about the computers? Have they got any problems? # Önerilen Cevap : There is a virus in the computer in the first picture because we can see a bug on it. However, the second computer is safe because we can see a virus protection image on the picture. # 2. Now listen and find the problem and the solution. # The problem is that you can get a virus while using the Internet. It can destroy all your programs and delete information you downloaded. The solution is to get a anti-virus program. It protects your computer. # 3. Listen again and complete the summary. # People can use the Internet for different things: communication, sharing or finding information, buying or selling things and so on. You can also download games and pictures. If you aren’t careful, you can get a virus . A virus enters your computer and stops it when you are working normally. It can destroy all your programs or delete information. You can sometimes get strange messages . When there is a virus in your computer, you must get an anti-virus program. You don’t have to buy a CD-ROM.You can download it from special websites to protect your computer. So, you can surf the Net safely. But you have to update it all the time because there are always new viruses. # 4. Answer the questions. 4) Because there are always new viruses. # 1. Match the phrases. You may match some phrases more than once. # 2. Complete the sentences with must or mustn’t. 1) You mustn’t open strange emails. 4) You must be careful with the person who you talk to. 5) You mustn’t use your real name. 6) You mustn’t tell anyone everything about you. # 3. Complete the phrases with these words: create, deactivate, log on, post, update, upload.